It's a rare end-of-summer treat, as one...no, wait, two of genre filmmaking's masters return to the big screen this weekend. Admittedly one isn't quite in the genre you'd first think, but he's a master nonetheless. While their two films try to dominate the box office, two others that feel like throwaways try to beg for scraps. Quentin Tarantino returns to the business of artful gore with Inglourious Basterds, a film set in Nazi-occupied France during World War II. 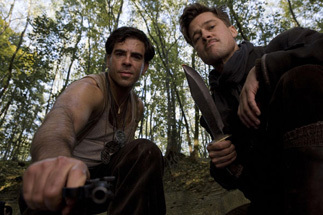 Brad Pitt heads up a secret company of Jewish soldiers dropped behind enemy lines and tasked to be as brutal as possible in the killing of Germans, in the hopes of terrifying them into abandoning the war. Hey, good luck with that. Let loose on this idea, Tarantino does his level best to produce one of the goriest and most over-the-top war epics, while mixing in his trademark verbose dialogue. Much like with Kill Bill (both of them), Tarantino seems to be working comfortably in the area of pastiche, and combining his influences into a blender, by way of commenting on them. More than any other filmmaker, Tarantino has consistently been able to deconstruct past movies and recontextualize the important parts into crackerjack entertainment. After the box office failure that was the Grindhouse experiment, Tarantino's gone a bit more conventional this time, or at least, what passes for conventional with him. Pitt's the main recognizable face, though Diane Kruger, BJ Novak and Samm Levine (and Mike Myers in a brief supporting role that's being hidden away in deference to his status as box office poison) will probably be familiar to a lot of people. In a fairly strange decision, fellow director Eli Roth, he of Hostel and Cabin Fever, takes the lead role as the most sadistic of the soldiers in the troupe. There's a lot banking on recognition of Tarantino's presence, and on just how much Brad Pitt is involved in the movie.